Mockingbirds are part of Mimidae, a family of more than 30 different species known for imitating sounds of other birds, insects and mammals. Mimidae birds have many behaviors in common, such as building bulky nests of twigs, breeding in monogamous pairs that can last a year or longer and laying clutches of two to five eggs. The only mockingbird found in North America is the common northern mockingbird. With gray feathering and a light grey to pale underbelly, the northern mockingbird is an intelligent bird with a far-reaching memory. Northern mockingbirds have been known to recognize the difference between humans that pose a threat and humans that have been friendly, helping them to adapt to urban environments. This ready co-existence with humans makes them a popular bird; the northern mockingbird has been featured in literature, cinema and is the state bird for five states. The blue mockingbird, endemic to Mexico, is easily recognized by its slate-blue base color, bright light-blue streaking on its breast and its black eye masking. Like its northern cousin, the blue mockingbird has adapted to a variety of habitats, including dry scrub land to humid forests, ranging from lowlands to elevations of over 8,000 feet. The blue mockingbird is shy, preferring to stay away from urban development, and forage for insects, berries and fruit on the forest floors. The Bahama mockingbird is found throughout the West Indies; the eponymous Bahamas, Cuba, Jamaica and the Turks and Caicos Islands. 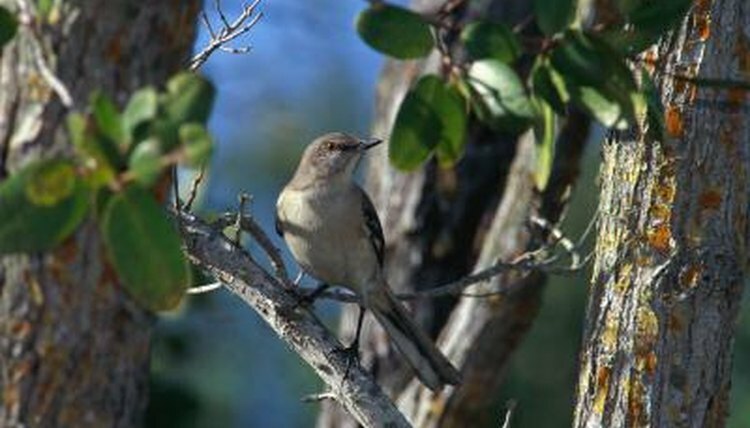 Larger than the northern mockingbird, the Bahama mockingbird is streaky brown in color, with a pale, freckled underbelly. The Bahama mockingbird inhabits rural scrublands found on the islands, staying away from humans and urban interaction. Summer migrations of the Bahama mockingbird have been found in southeastern Florida, but this vagrant behavior is not noted in the species as a whole. Fearless and aggressive, the endemic Galapagos mockingbird inhabits the islands of the same name. The social organization of the Galapagos mockingbird is unique to these Mimidae; the mating system of these birds changes, depending on the availability of females. When there are fewer females than males on the islands, the birds remain monogamous. When the scales tip, however, and there are more males than females, these dark brown and gray birds become polygynous, and may even share joint nests.